The 28th Gather will be held August 21st – 25th, 2019 (with an option for Monday the 26th), at Maryhill State Park, near the central OR/WA border where we Gathered in 2008 and 2010. Rolf Vitous will be Da Boss. The 25th Gather was held July 21st through July 24th, 2016 (Thursday thru Sunday) at the same spot where we Gathered in 2007 and 2011. MiG (with able Sub-Bosses Stevo & Sandra) handled BOSSing duties. The 23rd Gather — was held back at Crescent Lake, our 6th time there! The dates were August 7-10, 2014 (Thursday thru Sunday), with BOSS duties assumed by The Finance Minister & Her Minions. The 22nd Gather — was held August 22nd through August 25th, 2013 (Thursday thru Sunday) at the Locust Group Camp area near Kettle Falls, WA on the banks of Lake Roosevelt (aka the Columbia River). Robynn Coulter was Da BOSS. The 21st Gather was held August 9th through August 12th, 2012 (Thursday thru Sunday) at the Swiftwater RV Park on the banks of the Salmon River. HMarc was Da BOSS. The 20th Gather was held August 18th through August 21st, 2011 (Thursday thru Sunday) at the same spot where we Gathered in 2007, with Ed Hackett as Da BOSS. The 19th Gather August 12th through August 15th, 2010 (Thursday thru Sunday) was held for the 2nd time near the central OR/WA border where we Gathered in 2008. Phil and Debb Kopp were the co-BOSSes for the lucky 13th GPNDG which returned to the state of Washington for the first time this millenium (actually it's been 7 years since the last Washington Gather). The 2004 GPNDG was held midweek this year, from Monday July 5th through Thursday, July 8th. Mark Morrissey was Da Boss for the 12th GPNDG which returned to Crescent Lake for a 4th time. The 2003 GPNDG was held August 14th through 17th. Ed (Gooz) Guzman declared himself Da Boss and chose to use again 2001's excellent Idaho Panhandle site. The 11th annual event was held the weekend before Labor Day. See the Web page for details. Carl Paukstis decided to be Boss and selected the first Idaho Gather site, near Orofino and close to some great riding of all kinds. The 10th annual event was held the weekend following the 4th of July observation. See the Web page for details. Post-GPNDG photos from Gary & Shannon Kelley. Shannon and Gary Kelley Bossed once again and selected the popular central Oregon site for the 9th annual event. The Y2K GPNDG started on Thursday night, July 13th, 2000. See the Web page for details. The 8th GPNDG was held for the first time in California, under the most excellent Bossness of Mike Chaplin. The Web page has several links to photo pages taken by attendees. New standards were set, new faces were there, and there was music again! And some think this was the best Gather to date. We had live music (courtesy of Leigh Ann and Annwn). Some maps to the site. The viewpoints from BlackBear and Mickey Lyngholm, and some photographs from Terry Powell. Some think this was the best Gather ever. The original Announcement, and some stories & pictures collected by Frank Hilliard. Terry Powell was again THE BOSS. Terry Powell found this site, and was THE BOSS. The food took a serious turn for the better with Terry and Laurel's efforts. Cool campsite, but no water and a 'challenging' dirt road for some. Martin & Carol started the Beignet tradition here. The roots of the event. A fairly small number of us showed up, Jeff Earls checked our tire pressure (Gina won/lost with 17psi), and the single outhouse reeked. The river was nice. Want to BOSS a Gather yourself? Here's how to do it. 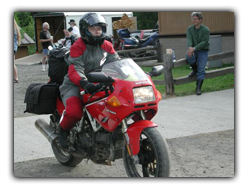 The terms "Great Pacific Northwest Dryside Gather", "GPNDG", "Dry Side Gather", and "Gather" (as applied to motorcycle campouts) are trademarks of GPNDG, Inc.,a Washington non-profit corporation.